The term Smart Maintenance stands for our comprehensive integrated concept for managing your maintenance – from the initial analysis of the condition of your rails right up to machining work. With Smart Maintenance, we concentrate on one essential aspect: the needs-based machining of your rails. Instead of indiscriminately deploying machines over a large area, we calculate in advance the amount of material that needs to be removed from each section of track and use this data to recommend what action you should take – ideally during the same shift. Very easily and step by step you can then create a customized maintenance plan that is cost-effective, efficient and, above all, simple. 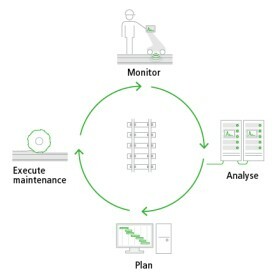 Lift your maintenance management to a whole new level – with Smart Maintenance. Make the decision to use the Smart Maintenance App and stay in touch with your railway network in the future. Our rail reprofiling machines having been upgraded to diagnostics vehicles, the principle basically works as follows. We measure your rails during grinding operations at speeds of up to 80 km/h (on mainline routes) without disrupting the timetable or closing any tracks. The results are presented to you through the App, which displays a diagram of your rail network and uses a traffic light system to evaluate its condition. You define the evaluation criteria yourself. The software uses this information to calculate potential maintenance scenarios, which include cost calculations and any track possession times that may be required. You then select a scenario and send your feedback directly to our machines via the App. The condition of your rail lines is displayed in the App in traffic light colors on a geographic route map. The red, yellow and green color-coding indicates the areas containing defects and how serious they are, or put another way: where and how urgently action is required. This makes evident what action needs to be taken and where. The map has an intuitive navigation function with which you can navigate to specific track sections and zoom in, allowing you to maintain an overview of your entire rail network. The longitudinal and cross-sectional profiles are measured during an HSG deployment. All the data on the current condition of the rails is interpreted, prepared and made available in the App. The data in the App is updated each time a rail is measured or machined. 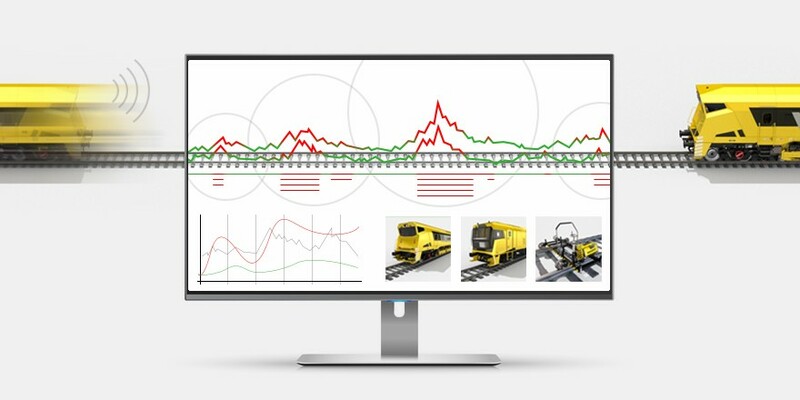 This enables you to keep a permanent eye on the condition of your rail network and to see which maintenance operations will be undertaken next. The database on the network and the network’s condition grows steadily in size and statistical significance, which in turn makes the algorithms for planning and forecasting more reliable and authoritative. You use the App via your own personal and secure user access. The App generates an exact representation of your rail network. You specify individual limit values and target values for rail defect tolerances. You enter various individual parameters, e.g. geographical environment of your rail lines, types of line (high-speed, light rail etc.) and more. In this way you can see exactly the information and parameter settings that are important for your maintenance. On the basis of the information that you provide on the targets desired for the condition of your rails, the system calculates possible machining strategies options, both corrective and preventive, e.g. a section of track with relatively serious rail defects can be machined in a single milling operation that would require the track to be closed. The alternative would be several grinding passes using HSG without closing the track. If there is historical data available, it is possible to determine a trend in defect development and an ideal time in the future to undertake preventive intervention. To allow you weigh up the options objectively, all the machining scenarios supplied by the App come with all the additional information such as track possession times, the number of passes required, overall costs, etc. This gives you the sound basis you need to make your decisions. It goes without saying, but we would still like to explicitly make it very clear: we ensure that all the data you deposit in your Smart Maintenance Account and the data we add during rail analyses and maintenance management is protected by the highest security standards. The latest security technology offers the best possible protection against unauthorized access, and of course we never forward your data in any form to third parties. Every interaction between you and Vossloh via the Smart Maintenance App takes place through an encrypted connection, so communication will not be visible to third parties.